Format: Region A Blu-ray, NTSC, Japanese Dialogue with optional Cantonese dub and English and Chinese (Traditional) Subtitles. Teenager Hikaru Raido (played by Takuya Negishi) returns to his hometown Furohoshi during the summer break. He has been living London with his parents for a couple of years as they chase their dreams of becoming musicians. He rescues a childhood friend, Misuzu Isurugi (Miyatake Mio), who becomes stuck in a runaway pram after attempting to help an old lady and her dog (I know, it’s kind of an implausible scenario…). Hikaru says he wants to visit his grandfather at the Ginga shrine, but Misuzu leads him to the local primary school. She explains that the shrine was apparently hit by a meteor and was burnt to the ground. The principal of the school, Kyoko Shirai (Kino Hana) and Hikaru’s grandfather Hotsuma (Tsugawa Masahiko) explain that the school closed recently due to lack of enrolments and the principal kindly let the shrine set up shop temporarily. Misuzu also decided to become a shine maiden. Hotsuma explains that at least the sacred relic survived the fire. Hikaru suddenly feels the need to see the relic, but cannot fathom why he feels this way. Later than night, Hikaru sneaks into the shrine to inspect the sacred relic. He grabs it and sees visions of large beings fighting monsters. A hexagon symbol briefly appears on his hand. A voice asks him if he seeks adventure. Hikaru is surprised to discover that it seems to be coming for a small plastic doll. The doll introduces himself as Ultraman Taro. Hikaru thinks someone is playing a prank on him. But the doll disappears out of his hand as if teleporting. Taro tells Hikaru to come to Mount Furohoshi. Regardless, the next day Hikaru hikes out to the mountain where he meets Taro. Taro explains that the Ultramen and monster where shrunk and turned into dolls by a malevolent force and traveled through space where eventually they landed on the mountain. On the mountain Taro discovered the Ginga Spark, the sacred relic in the Ginga shrine that apparently has the power to beat its evil opposite, the Dark Spark. However only a saviour can use the Ginga Spark which Taro believes is Hikaru. He also believes that he restore his original form. This involves placing the Ginga Spark on the hexagon symbol on the base of Taro’s left foot, however it doesn’t work. Later Hikaru bumps into Misuzu who is out having a picnic. She is upset with him that he has taken the Ginga Spark from the shrine, and surprises him by revealing that she already knew about Taro. Hikaru is drawn to spot behind a bush where he discovers another doll, a dinosaur creature called Black King. Feeling as he has nothing to lose, he tries the Ginga Spark on the doll and it works. But somehow Hikaru’s soul has been transposed into the now giant Black King monster. There’s no time to figure out why the Ginga Spark only worked on Black King, as a giant monster seeming revived by the Dark Spark, Thunder Darambia, arrives to attack Hikaru. Just as Hikaru looks like he is about to be beaten, a new doll materialises out of the Ginga Spark, Ultraman Ginga, which Hikaru then uses to transform into and defeat the monster. Ultraman Taro hypothesises that Hikaru can enter the bodies of the Ultramen and monsters because their souls where removed when they were shrunk and turned into toys. Taro’s soul was retained in his body even as toy due to Ultraman and Ultra Mother protecting him. It also becomes apparent the monsters attacking the town have all been resurrected by the Dark Spark, by someone inside the school. The dark elements of former students of the school have become the elents driving the monsters. Two of Hikaru’s old friends, Kenta Watarai (Ono Mizuki) and Chigusa Kuno (Kirara) even end up becoming the souls of monsters at one point. Even Misuzu becomes a monster. What is the link between the school and the person who is wielding the Dark Spark? Apparently this show was made as part of Tsuburaya Productions 50th anniversary of the company. Ultraman stared back in 1966, but despite being dubbed in English and broadcast on US TV in 1967, it never really took off in the western world, despite many attempts to get various parts of the franchise into the consciousness of the English speaking world. Not helping is the ongoing dispute over who holds the rights to the various early TV series of the show outside of Japan. In Japan it’s ingrained in the public’s conscious. Everyone knows who Ultraman is. It was a massive hit in the 1960’s and early 1970’s, but popularity of the show waned in the very early 1980’s, until it made a resurgence with “Ultraman Tiga” in 1996. There isn’t a great deal of tokusatsu material available commercially in English. When that material is available on blu-ray, well, my wallet automatically comes out. As per most Hong Kong releases of this type, it’s pretty bare bones. You get the show and that’s it. No trailers for other movies or TV series, let alone extras for the show. Surprisingly the subtitles are professionally translated (which to be fair is far more common than the Engrish horrors of commercial Hong Kong DVDs of 10 or 15 years ago), but do contain some typos in the latter episodes. The video and audio are good as you’d expect. 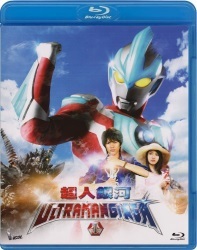 However my joy at having a slightly obscure Ultraman show on blu-ray and subtitled was tempered by the fact it’s not a very good show. To be blunt, it plays out as a really crappy drama with Ultraman elements tacked on. The core cast (Hikaru and his three friends) are picked from acting schools who promote their talent if they were male idols and the two female leads are in idol units. The acting is what you’d expect; utterly mediocre at best. The regular supporting cast are older adults (the principal, the priest and an incompetent cop) and like the younger cast are also pretty underwhelming. Admittedly they don’t have much to play off. The script is really hammy and goofy. Nearly all of the action takes place at the school, so with that and the fact the cast is pretty small, you can tell this show has a meagre budget. But what really pisses me off is the blatant merchandising within the show. The dolls of the Ultramen and monsters are the exact same ones you can find in toy stores all over Japan. Even Taro is the exact same toy you can find in a store. He’s crapily manipulated like a puppet for the entire show, with some close up shots of the actual Ultraman Taro mask added in. At the end of almost every episode, there’s a short called “Spark Doll Theatre” where Taro and a few of the monsters as dolls do silly comedy skit, with Taro usually saying “I want to become big!” at the end. That right there says it all about this show; it’s all pretty daft and silly. Interestingly the follow up series “Ultraman Ginga S” and the latest series “Ultraman X” (which the few episodes I saw on TV in Japan back in November and December didn’t impress me) use the same Spark Doll idea at their core. The second half of the show is a little better. The core cast, plus a few outsiders become trapped with the school and numerous monsters appear. Somehow it seemed be a lot more intense this way. There’s also the theme of broken dreams played out through the series, though this intensifies towards the end. However towards the climax of the series it, all becomes a bit schmaltzy. Granted this is not all that uncommon in some Ultra series (especially some of the films from the 1990’s onwards), but here it’s just adding to the pain of a show that’s not that great to begin with. All of the monsters and Ultramen (besides Ginga of course) are from or are variants from various Ultra series. One could suggest this is a great budget saving measure as the producers could just raid the Tsuburaya archives for old suits rather than making new costumes. But fans would get a lot of pleasure spotting some famous and rather obscure monsters from years gone by. Summing up, it’s a pretty crappy show. I can’t believe that Tsuburaya Productions would make this cheaply produced crap their 50th anniversary show. Yes the fights are pretty decent, but that’s all you could say was good about the show. The follow up series, “Ultraman Ginga S”, is more of a traditional team show with lots of mecha as well as monsters and looks a lot better than this show. There is a preview at the end of the last episode of the disc, but so far no blu-ray release of the show in Hong Kong or anywhere else in English. Despite the fact this show is a rarity (i.e. a modern tokusatsu commercially available in English on blu-ray), the quality of the show should make you think twice before purchasing it. 5 out of 10, and I’m being very generous with the score. Remaining Backlog: Five series, one movie, one OVA also waiting for second parts for two shows to be released before viewing them.